“Diamonds are Forever” but what about the Diamond in each of us? CLI’s Diamond Concept shows us that each issue in our life is like a Diamond with many facets. 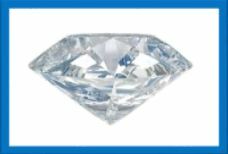 For example with the Diamond Concept a client may be looking at many facets of Anger in his life and may wish to work on becoming a better communicator in these different facets of his life. What does this actually convey? One triangle facet – He has difficulty telling his wife he loves her. Second triangle facet – He wishes his wife would hug him. Third triangle facet – His boss is really bugging him. He wishes he had the courage to tell him the truth about how he is feeling. Fourth triangle facet – He is not communicating well with himself these days; he wishes he could pay more attention to his intuition and act on it. In other words, there are many “facets” to an issue and we simply need to self coach or take the help of CLI Power Coaches until those facets are well polished wherein we feel peaceful about the issue and have solutions. As part of CLI’s Leadership Development Course we learn that each of us has “frustas” or frustrations (all the fears, feelings, distorted thinking, irrational thoughts and so on that are blocking us from moving forward). When we eliminate the frustras in each diamond of our life, we polish the diamond and come closer to having a happy life. Making our life shine again like a beautifully polished diamond is a marvellous gift to give ourselves.